In Illinois, homeowners who are facing foreclosure but without the means to hire an attorney were given a stronger chance against lawyered-up banks thanks to simplified and standardized court filings. In New York, tenants on the brink of eviction but similarly unable to afford a lawyer can take advantage of court employees tasked with helping self-represented litigants navigate the court system. A driving force behind both of those changes? State-based alliances with a focus on access to justice. Access to justice commissions, which did not exist before the 1990s and have become increasingly common across the country in recent years, are helping the justice system address a painful reality — more and more people facing life-altering legal issues can’t afford lawyers. 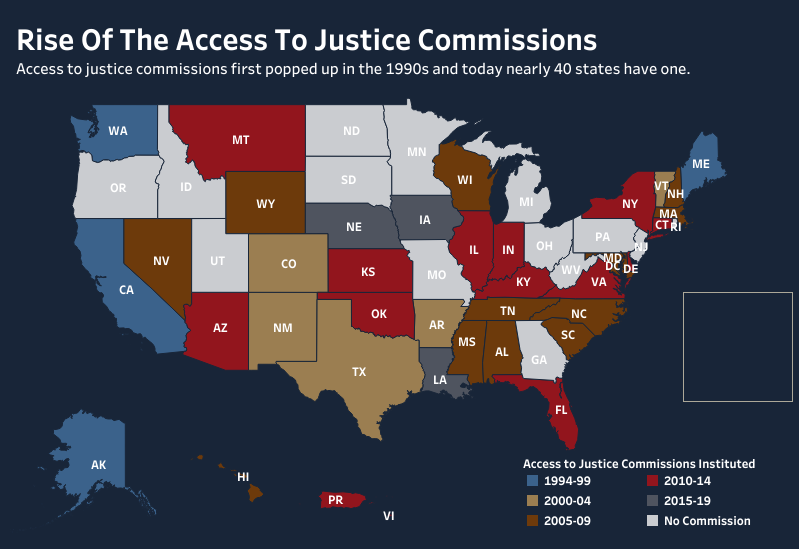 Currently, 36 states, as well as Washington, D.C., the Virgin Islands and Puerto Rico, have access to justice commissions. Twenty-five years ago, there were zero. Additionally, five other states have entities other than commissions that are devoted exclusively to addressing access to justice issues. The commissions often include judges, court administrators, lawyers, representatives from legal aid organizations, members of legal academia and business leaders. Some have full-time staff, while others operate entirely through the help of volunteers. Many commissions are set up by the state’s supreme court, while others are independent of the court system. But despite their differences, the commissions share a common goal. “These commissions are wholly committed to making our justice system work better, to making it more accessible to more people, and to making sure that cases that are filed are decided on the merits of the case and not on whether one side or the other has enough money to hire an attorney,” Flynn said. Access to justice commissions are able to tackle justice gaps in two ways: by making it easier for those without attorneys to navigate the system and by finding ways to get people who couldn’t otherwise afford it the help of lawyers. In 2012, the Illinois access to justice commission began to focus on creating standardized and simplified court forms to make navigating the court system easier for self-represented litigants. Now, there are more than 25 forms used statewide in areas such as family law, small claims and mortgage foreclosure, according to Alison Spanner, assistant director of Illinois’ civil justice division and an administrative official for the commission. The forms are created at a sixth grade reading level and include instructions on how to complete the form itself, how to file it, how to serve it, and how to participate in the court proceeding, Spanner said. While the standardized forms, in theory, could have been implemented without the commission’s help, its advocacy was an effective vehicle for driving the change, according to Bob Glaves, director of the Chicago Bar Foundation. “It’s a much more efficient and inclusive way to be able to gather input and feedback and involve the court from the get-go so that you get better policies but in a more efficient and timely way,” he said. New York is also tackling the issue of unrepresented litigants, through a program spearheaded by the predecessor to the state’s access to justice commission. In 2014, the New York City Court Navigators Program was launched following a recommendation made by the state’s Task Force to Expand Access to Civil Legal Services. Under the plan, courts in the city turn to non-attorney “navigators” — often college students — to help unrepresented litigants access information, complete forms, and assemble and organize documents. Those navigators also arrange for interpreters and other services, explain what to expect in the courtroom and provide moral support. Navigators are allowed to accompany litigants into the courtroom, and may respond to any factual questions the judge directs to them. The navigators represent a “straightforward way to ensure greater fairness in the civil courts,” the study found, suggesting the program could be a model for other courts beyond New York. Access to justice commissions are also working to match lawyers with low income individuals by increasing funding for legal aid. According to Washington, D.C., access commission chair Peter Edelman, the main goal of his commission since it was created more than a decade ago has been to generate as much money as possible for legal aid in the District. At the time the commission was started in 2005, the District of Columbia did not allocate any funds to legal aid providers like the Legal Aid Society of D.C., which provide legal representation to low income people in court in areas like housing, domestic violence, public benefits and debt collection. The newly-formed commission launched a public campaign, garnering support from a number of players including bar leaders, and achieved their goal of successfully lobbying the district to allocate funds to local legal aid providers. That first year, the commission was able to secure $3.2 million for service providers, and Edelman says that annual allocation has grown to just over $10 million today. Additionally, the commission in recent years was able to push for another $4.5 million specifically for legal representation for low income people facing eviction, and also helped orchestrate $5.5 million in private funding last year alone. As they mature and evolve, existing commissions are planning their next wave of projects, from improving language access in the courts for those for who are not fluent in English to leveraging new legal technology to help people navigate the court system. But while most states have adopted access to justice commissions, there are still a few — Pennsylvania, New Jersey, West Virginia, Missouri, North Dakota, South Dakota, Idaho and Utah — that have neither a commission nor a similar non-commission entity recognized by the American Bar Association. Many say that will likely change. “I think that the more people talk to each other in different states, the more states realize it is helpful and they are moving in the direction of establishing something that feels like an access commission,” said California Court of Appeals Justice Laurie Zelon. Part of their efficacy, according to Justice Zelon, is their ability to draw in people from different sectors, professions and areas of expertise, all of whom share a common goal — something that is hard to find absent a commission. She pointed to the California commission’s work setting up incubator programs to train new lawyers to represent people at affordable rates. The Commission got the funding to make the seed grants, put together guidance materials, and got the programs off the ground. Amy Johnson, director of Arkansas’ access commission, echoed that sentiment. It can be all too easy for philanthropic and legal aid efforts to be made in siloes, she said. “I see access to justice commissions as a way to bring together multiple sectors and come up with systemic responses to those problems,” Johnson said. Correction: A previous version of this story misidentified the organization for which Bob Glaves serves as executive director.